Perhaps the biggest attraction to indoor and greenhouse horticulture is the enhanced control over the environmental conditions. Along with controlling the temperature and humidity so they stay within the optimal ranges for plant growth, an indoor or greenhouse horticulturist is able to further optimize atmospheric conditions by supplementing additional CO2. By increasing the CO2 levels in a garden’s atmosphere, the plants are given the chance to grow at rates that cannot be found in nature. The increased CO2 levels in the garden’s atmosphere allow the photosynthetic process to happen more quickly. In other words, increased CO2 levels (assuming all other contributing factors are in check) will accelerate the rate of photosynthesis and, therefore, the rate at which the plants grow. For years, indoor horticulturists have been reaping the rewards of increased CO2 levels in both the vegetative and blooming rooms. In addition to the benefits gained in the vegetative and blooming rooms, many horticulturists are enriching the CO2 levels in the cloning area to increase cloning success. Enriched CO2 levels in the cloning area can provide many benefits, including increased rate of root initiation, reduced transpiration/water loss, and a better resistance to pathogens. CO2 in the cloning area is beneficial when supplied to the clone’s leaves, not its root zone. For example, if a grower is using an aeroponic clone machine, the CO2 should be added to the area where the leaves are and not to the chamber where the roots are or will be. In propagation dome set-ups, which house the entire clone (both the leaves and the area where the roots will form) it is important for the grower to closely monitor the CO2 concentration so the roots will still have access to plenty of oxygen. When the leaves of the clones are supplied with enriched CO2 levels, the chemical equation known as photosynthesis can occur at a faster rate. This means the clones can absorb CO2 through their leaves and, with the addition of water and light energy, create sugars. These sugars are the important fuel that provides the clones with the necessary energy for initiating and producing roots. Raising the CO2 levels in the clone area increases the speed at which these valuable sugars can be produced. When the sugars needed for energy are produced more quickly, the clones can, in turn, create roots more quickly. The sooner a clone can produce roots, the sooner it can be transitioned into the vegetative stage and acclimated to its new environment. Generally speaking, the faster a batch of clones can develop roots, the higher the overall success rate of cloning. Consistently maintaining the proper humidity levels is a crucial factor for cloning success. One of the main reasons why clones are kept in a high humidity environment is because, without a root system, the clone’s leaves become the main source of water control and retention. Without a high humidity environment, many varieties of clones would transpire moisture to the point of wilting. In extreme cases, clones without access to moisture in the air can transpire to the point of death from lack of water. A plant transpires moisture to help maintain a proper temperature on the surface of its leaves. A high humidity environment reduces the cutting’s need for transpiration and protects the cutting from losing too much moisture. To make sense of the relationship between transpiration and CO2, a gardener must understand the impact a CO2 enriched environment has on a plant’s stomata. Plants absorb carbon dioxide through the stomata on their leaves. When the stomata are open, the plant can absorb CO2. Transpiration also occurs when the stomata are open. Transpiration creates water loss for the plant and, because water is another significant chemical compound for photosynthesis, the plant will try to conserve water by automatically regulating the amount of time the stomata are open. When an indoor horticulturist or greenhouse gardener enriches his or her cloning environment with CO2, the plants can absorb more CO2 when the stomata are open. This reduces the amount of time the stomata must remain open and also reduces the amount of water lost through transpiration. In other words, the plant can absorb higher amounts of CO2 and limit the water lost through transpiration. In addition to the duration that the stomata are open, enriched CO2 levels can alter how wide the stomata open. Put another way, when provided with an increased amount of CO2, the stomata on the clone’s leaves will not open as wide, thus reducing the amount of water lost through transpiration. Without roots, any moisture lost though the leaves is significant and, therefore, any reduction in transpiration is a big advantage for rootless clones. Simply put, increased CO2 levels will increase the efficiency of a clone’s water usage and this can mean the difference between wilted foliage and perky leaves. Unfortunately, the ideal environmental conditions for cloning most plant varieties (warmer temperatures and increased humidity levels) are also the conditions conducive to many pathogens. Molds, mildews, and bacteria, including powdery mildew, root rot (pythium), and grey mold, are some of the pathogens that find the cloning area’s environment ideal for feeding and breeding. One of the best ways a gardener can reduce the likelihood of these pathogens is to enrich the cloning area with CO2. Enriching a cloning area with CO2 is an effective and safe way for an indoor gardener or greenhouse hobbyist to protect vulnerable cuttings. The effectiveness of CO2 as an anti-fungal is derived from its ability to alter intracellular pH levels. It has been discovered that enriching the cloning area with CO2 alters the pH of the surface of the clone’s leaves which makes it impossible for particular fungi to become established. Many of the products on the market that are designed to treat or prevent fungi in the garden are effective because they alter the pH of the leaf’s surface. Sulfur is a prime example of this phenomenon. As with other areas of an indoor garden, prevention is the key to reducing the likelihood of pathogens. Enriching the clone area with CO2 can help prevent problems before they occur. Clones that can develop unhindered by pathogens will have a better chance of rooting quickly and becoming the foundation for strong vegetative plants. As with the vegetative and blooming areas, there are several different ways a horticulturist can increase the CO2 level in the cloning area. Any device that can increase the CO2 levels in the atmosphere can theoretically be used to increase CO2 levels in the cloning area. CO2 burners, compressed CO2 tanks, or mycelium bags could all be used to increase CO2 levels in the cloning area. However, when it comes to clones, too much of a good thing can be bad. Some CO2 systems, including CO2 burners and compressed CO2 tank systems, are typically used to provide CO2 to a large area. When using one of these systems for clones, a horticulturist needs to use caution and avoid CO2 levels that are too concentrated. 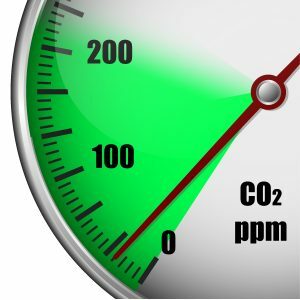 For clones, CO2 concentrations should not exceed 1000-1300 ppm. Levels above this could be counterproductive as the available oxygen gets displaced by CO2. The clone’s roots (or potential roots) need oxygen to develop quickly and properly. 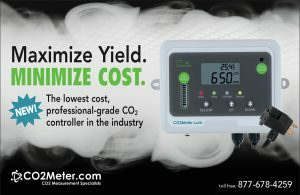 Growers who choose to use CO2 systems designed for larger areas must have a CO2 monitor/controller so the CO2 levels don’t exceed the desired level. The preferred methods for administering CO2 to clones are the CO2 devices designed for smaller areas, such as CO2 pads or the smaller sized mycelium bags. These types of CO2 devices can actually be placed directly inside of a standard propagation tray and dome. The CO2 pads are activated by the humidity within or when the horticulturist mists the clones with water. 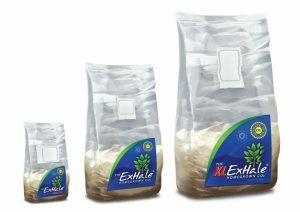 The small mycelium bags produce CO2 as a by-product of the fungi contained within the bag itself. Small mycelium bags and CO2 pads that are made for small spaces, such as a propagation dome, can be used without worrying about over-concentration of CO2. Most CO2 products designed specifically for small spaces will put the CO2 levels within the desired range for clones. Maintaining the ideal CO2 levels for the cloning stage will increase the rate of photosynthesis and prevent certain pathogens from establishing, without displacing too much oxygen from the root zone. range for root development to occur quickly and seamlessly. Adding CO2 to the cloning area is one of the most effective and safest ways to increase overall cloning success. Enriched CO2 levels can help clones establish roots faster; thus, allowing the plants to be cycled into the subsequent stage of growth more quickly. Water loss can be detrimental for clones that do not yet have a root structure. Increased CO2 levels in the cloning stage will help most plant varieties reduce water loss through transpiration. Enriched CO2 levels can also be a much needed protection against a wide variety of pathogens that find the warmer temperatures and higher humidity of the cloning area perfect for setting up shop. Simply put, increased protection from pathogens equates to a higher cloning success rate. Whether a horticulturist chooses a CO2 system teamed with a CO2 controller/monitor or a CO2 device designed specifically for smaller areas, enhanced CO2 levels in the cloning area can be vital for increasing the rate of root initiation and the overall success of the cloning process. Eric Hopper resides in Michigan’s beautiful Upper Peninsula where he enjoys gardening and pursuing sustainability. He is a Garden & Greenhouse senior editor and can be contacted at Ehop@GardenAndGreenhouse.net.